Like most family businesses, Pine Tree Barn began with a dream. Bob and Betty Dush both grew up on farms and were taught to be good stewards of the land. This led Grandpa into a career as a Soil Conservationist here in Wooster, while Grandma was a beloved second grade teacher. Bob was the first in his family to attend college, and with three kids of their own coming up, he and Betty were determined to do the same for them. 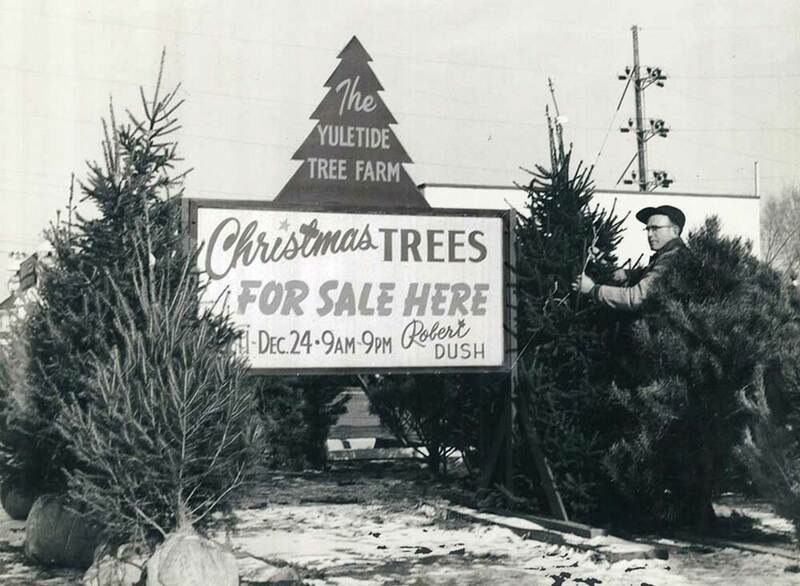 Realizing they would need some extra income, they had an idea that some thought a bit crazy: Growing and selling Christmas Trees. They found and bought an abandoned farm, used the family car as a tractor, and spent countless hours tending those first seedlings. Their new baby was called “Yuletide Tree Farms”. Their hard work made it a successful operation; it was one of Northeast Ohio’s first plantation-style farms. By the late 1960’s, they were ready to expand. For years, Grandpa had had his eye on a farm 4 miles down the road, a beautiful site with rolling hills overlooking the fertile Kilbuck Valley. With his typical soft spoken charm, he shared his vision with the elderly widow who lived in the old farm house and convinced her to sell the property to them. The 1868 bank barn served as perfect place for the farm equipment, as well as a place for customers to warm themselves with hot cocoa after spending time in the fields choosing and cutting their tree. Being a Soil Conservationist came in quite handy on this new farm: because of the hills and valleys, Grandpa choose species and varieties that flourished in the wide range of soils found on the farm. Always looking for new projects, he pondered the low, spring-fed wet ground in the valley. Although some told him it would never work, Bob set about building a lake – a 30 acre beauty that highlights one of the most pleasant views in the area. He was right - again! In the late 70’s Bob and Betty’s son Roger joined them. Roger’s dream was to grow the business in a new direction: a year round retail shop that would be so much more than just Christmas items. From the “roots” of Yuletide Tree Farms, “Pine Tree Barn” opened for business in September 1980. As a team, my parents, Roger and Rita, did it all: they shopped, planned, painted, built, did displays, picked up orders, made sandwiches - even made deliveries! Grandma kept the books for the new operation while Grandpa continued farming. Of course, the German Nutcrackers, Smokers and Ornaments were still part of the shop. But now, in addition, were antiques, dried flowers, ribbons, pottery, gifts and toys. At the snack bar, the modest hot dogs, sandwiches and drinks were replaced by a cafeteria style dining room with the quiche, chicken fruit salad and pies which are still mainstays in the Granary Restaurant today. As it became more challenging to find great antiques, my parents decided to investigate high quality reproductions. Once they started selling 18th Century furniture, they realized they needed upholstery to go with it. That was the beginning of a new dream: the Furniture and Interior Design business. We are now the third generation to continue in the family business. Today, nearly 60 years later, Pine Tree has grown beyond what most would have imagined. Every day we are grateful for the dedication of my grandparents and parents to their dreams – a dream that began as a crazy idea so many years ago. We are a third generation family business committed to providing an outstanding customer experience. We offer quality merchandise that is competitively priced and backed by great service. When you browse in our store, you will enjoy full room settings and vignettes. Dynamic and Creative Visual Display are our Pride and Hallmark. We shop 5 major markets a year as well as several smaller ones to bring you the most interesting range of product available in each category - and we have a lot of categories!